Tech Tips Video: How much antibody should I use for ChIP? It's time to check out another video from the CST Tech Tips playlist! In this edition of Tech Tips, we'll tackle a common protocol question customers ask our ChIP team: how much antibody to use for chromatin immunoprecipitaion (ChIP) experiments. 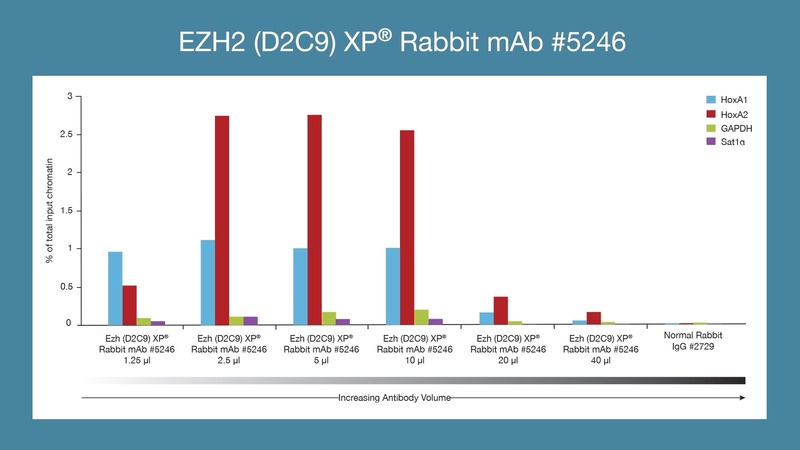 Adding more antibody isn't always better - watch the video to learn why. Don't forget to subscribe to CST's YouTube channel for more videos to help your research! How much antibody should I use in a ChIP assay? I'm Fang Chen, Senior Scientist in the ChIP group at Cell Signaling Technology, and this is CST Tech Tips. The optimal amount of antibody to use in a ChIP assay varies, depending on the antibody's affinity, sensitivity and specificity. More antibody is not always better. As you can see in this titration data, both too much and too little antibody decreases ChIP signal. For most ChIP-validated antibodies, 0.5-2 µg of antibody generates an optimal signal-to-noise ratio in the ChIP assay. During our in-house antibody validation efforts, scientists on the ChIP team perform titration experiments using 10 µg of chromatin per IP in order to identify the optimal antibody dilution and then provide that information to you. It's very important to maintain the ratio of antibody volume to the amount of the chromatin, rather than the ratio of antibody volume to the IP volume. For example, CST recommends using 10 µg of chromatin DNA per IP. However, if less than 10 µg of chromatin DNA is used, then the antibody amount should be decreased proportionally. CST recommends a total volume of 500 µL for each IP. If ChIP is performed with same amount of DNA but in a larger IP volume, then no extra antibody is required, although a longer incubation time might be helpful to compensate for the diluted reaction. For a control antibody such as IgG, you should use an equivalent amount as your test antibody for a fair comparison. Thank you for watching. You can find the full protocol course for all applications on each antibody's product page at cellsignal.com. If you have any questions about an antibody or protocol, you can get in touch with one of our scientists at cellsignal.com/support. Don't forget to subscribe for your new Tech Tips videos, and we will see you next time.